Shop! harriscyclery.net Catalog for a more Contemporary Experience. For many, many years the T.A. Cyclotouriste was THE triple, and was standard eqiupmemt on virtually all top-of-the-line touring machines. They are unusually light, and have very narrow tread (a.k.a. "Q-factor"). Cyclotouriste triples work best for half-step plus granny setups, where the middle chainring is only a few teeth smaller than the large one. They don't work with many newer "MTB-type" front derailers, due to tight clearance between the outer ring and the inside of the arm. As it turns out, half-step-plus-granny setups work better with "double" type front derailers anyway. This is on my Hetchins, it's a 50-28 double, running with a 12-28 9-speed cassette in back. It is mounted on a Shimano UN series bottom bracket, 115 mm. This sets the chainline up closer in than most double cranksets. The idea of this setup is that the 50 tooth chainring is usable with all 9 rear sprockets, and on most rides the 50 is the only chainring I use. The 28 tooth chainring is the emergency "bail out" gear for unusually steep hills, or for when I'm all tuckered out. It is only used with the larger rear sprockets, but when I need that low a gear, I don't mind the big jump. Click here to see a gear chart for this setup. Finally! An affordable French thread bottom bracket set! They're back! Affordable, traditional bottom bracket cup set! Cups, lock ring and retainer bearings, 35x1mm threads, Dual Right hand thread. Fix that old Peugeot, Motobecane or Gitane on the cheap! Click here for bottom bracket axles. Many French bikes sold before the late 1970s used the now-obsolete French bottom-bracket threading: 35 mm x 1mm (1.378" x 25.4 TPI), right-hand thread on both sides. Instead of the ISO standard threading: 1.370/1.375 x 24 TPI left-hand fixed cup, right hand adjustable cup. If your frame is made for a French-thread bottom bracket, a standard adjustable (right) cup will fit in, at least a little way but it will be very loose and will be unusable. We were probably the last online source for loose-ball French bottom bracket parts, and the supply has just been replenished!. The diameter and thread pitch are the same as French, but the Swiss fixed (right side) cup has a left-hand thread. 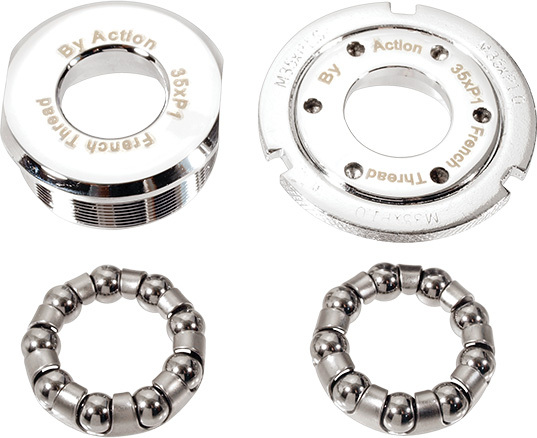 We were probably the last online source for loose-ball Swiss bottom bracket parts, but the supply has been exhausted. The only alternative currently in production is Phil Wood. They're a great product, but expensive. 84.6 Old Campagnolo standard, still used for track applications. The diameter is standardized, but the bevel is not, so it is often necessary to do a bit of filing to get the correct angle and depth of bevel. They should generally be replaced in pairs. "Jeux de Grain" bolt sets for early T.A. Cyclotouriste cranks. No longer available. The very early versions of the T.A. Cyclotouriste crakset used a special axle that was round with one sharp corner. The cranks were secured by these bolts, which look something like traditional cotters. They are not, however, traditional cotters. The bolt has a sliding bushing that presses on one side of the axle, while the special nut presses on the other side.